Home >> Archives >> Articles with keyword "dynamic modeling"
Articles with keyword "dynamic modeling"
S. Jordan and A. Q. Philips. 2018. 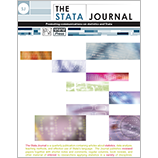 Stata Journal Volume 18 Number 4.